Editor’s Note: As part of our follow-up to last year’s Australian Watch Week, we’re taking another look at Bausele – this time the well-priced ceramic pilot. 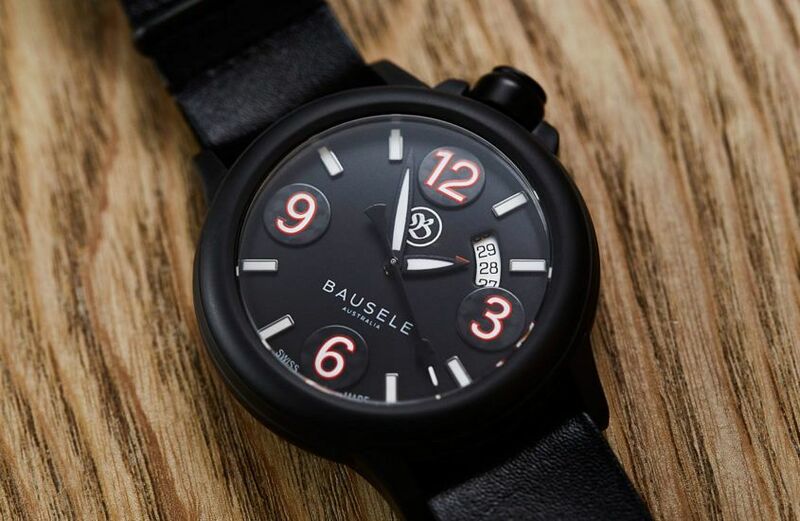 It’s been a little while now since we checked in with Bausele, which has continued to carve its name into the local watch scene. Now it looks set to crack the American market, recently signing English/Aussie /LA-based actor Dominic Purcell, famous for his stint in Prison Break, as the face of its new campaign. Today we’re taking a look at the Pilot All Black, which features an unusual and eye-catching dial layout. Bausele has moved the 12 from where it normally sits, to what is traditionally the two o’clock position, and, no, that’s not just trying to be different for the sake of it. Built with pilots in mind, it’s a functional choice allowing anyone with their hands on the controls to easily read the time without letting go. #safetyfirst. Take a closer look at the dial and you’ll see it’s not your simple printed number. The red numerals look to have been applied onto carbon fibre discs, which adds to the exotic materials used, while the hands and hour markers are lumed, making the watch easy to read. The only jarring note is the altimeter-style date window; though it’s useful, it adds a big splash of white to an otherwise black dial. The Pilot comes with two easily interchangeable strap options: there’s rubber or the kangaroo leather pull-through strap, which feels great. 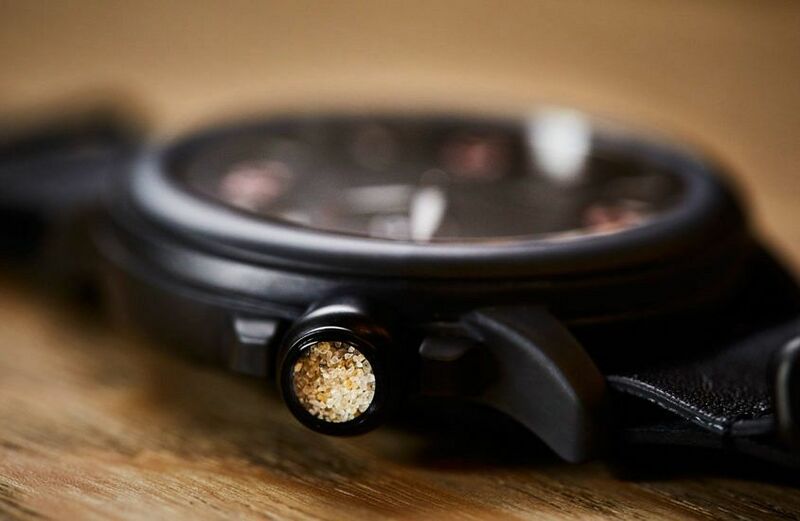 The real stand-out feature of this watch is the 44mm matte black ceramic case, a remarkable inclusion at this price point; it’s not often you see ceramic on anything under $2K. Meanwhile, inside, we find a reliable SW200 Sellita automatic movement, visible through a clear caseback. On the wrist, this is extremely comfortable due to the lightweight ceramic and supple ‘roo strap. In terms of readability, the rotated dial does make checking the time a little more convenient, though it takes some getting used to. 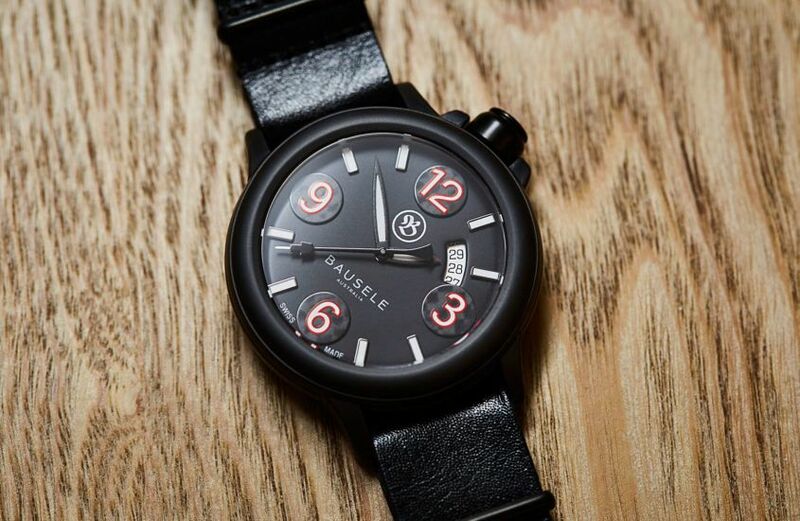 The Bausele Pilot Automatic All Black, $1900, limited edition of 75 pieces.